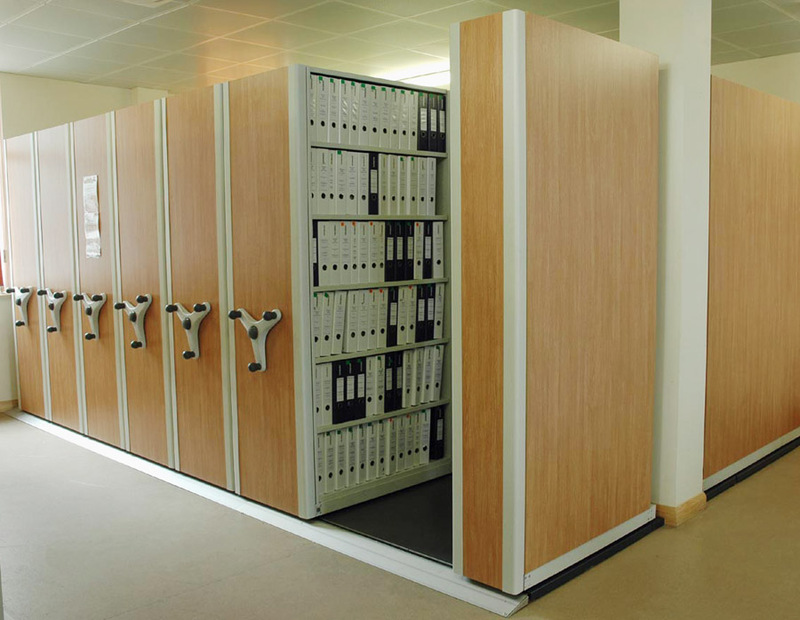 Our high density mobile filing units are a popular choice for compact file storage in offices and archive rooms - each one designed to save valuable floor space and increase storage capacity. 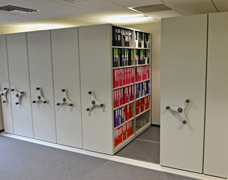 Mobile file storage is ideal for Government departments and businesses where the highest possible density of is required. 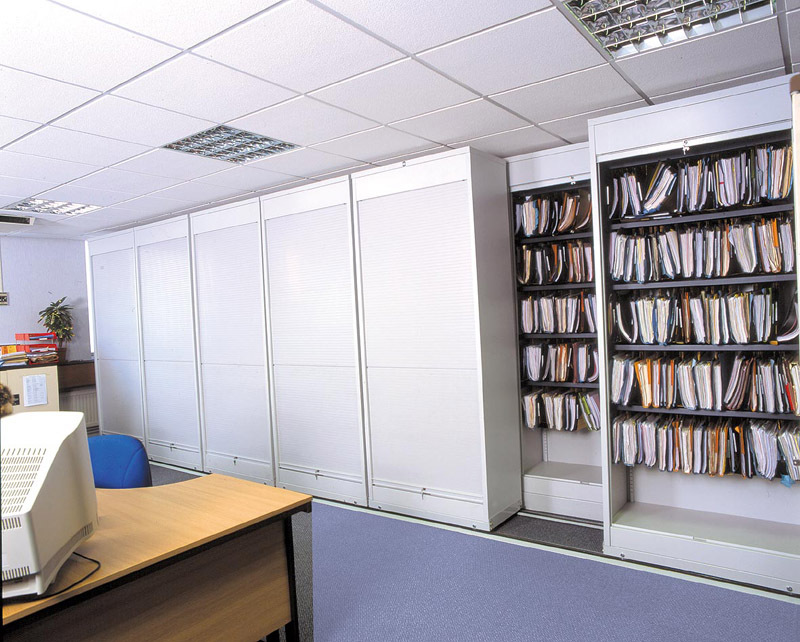 The mobile office shelving systems shown here have decorative end panels that can be finished to match the office decor and provides a flush finish to the end of the shelving. 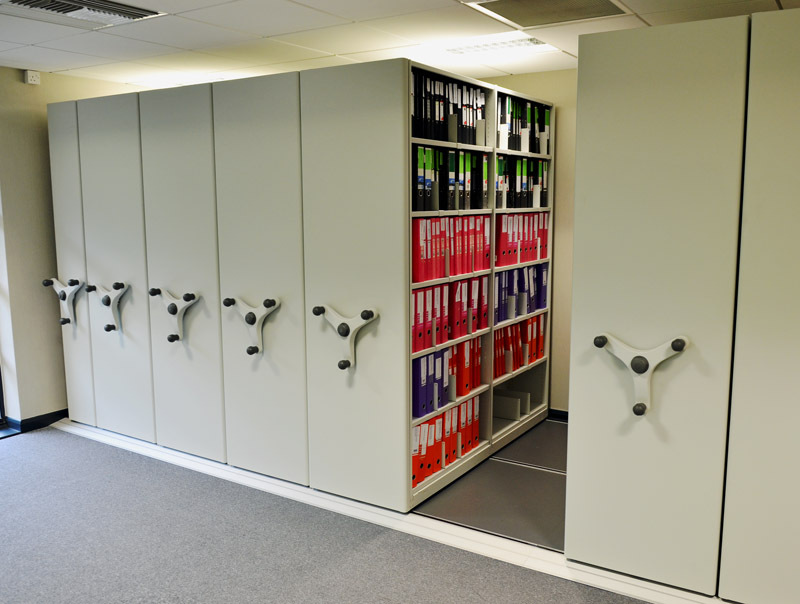 We design high density mobile office storage solutions to suit your specific requirements from a wide range of standard size shelves enabling all of the available space to be used. 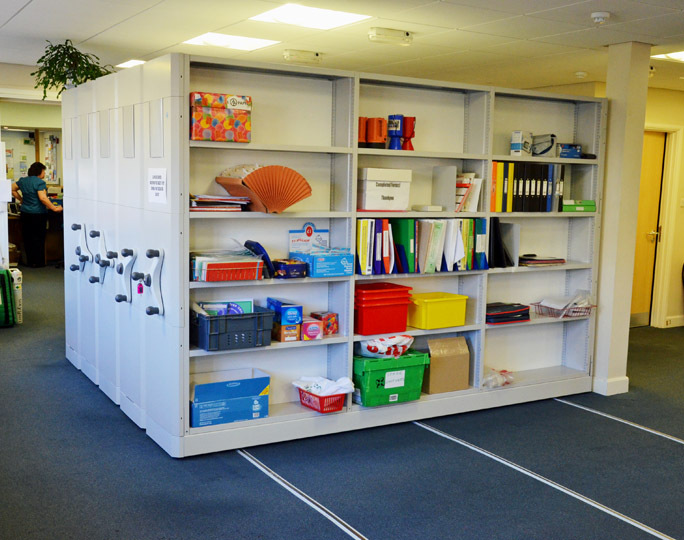 The modular track system provides a flush raised floor that is supplied with a non slip finish or can be tiled or carpeted to match the office environment. 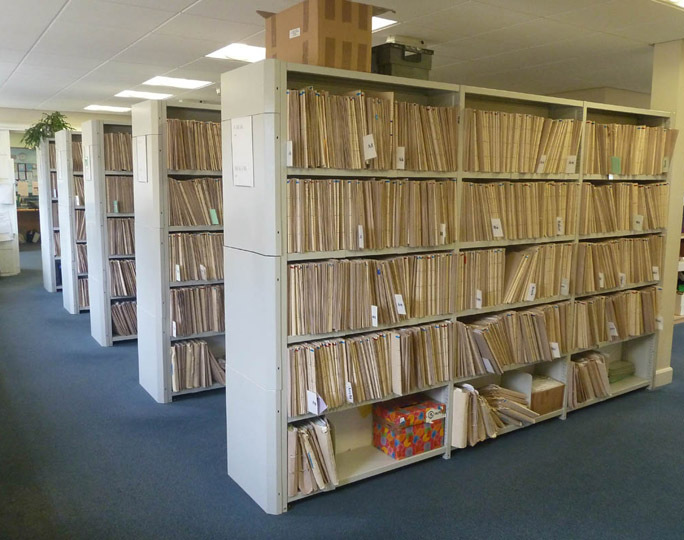 Office shelving solutions that utilise mobile bases can increase capacity by 100% in many applications when compared to conventional fixed shelving. 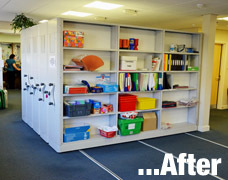 The modular nature of the mobile storage system makes it easy to adjust, add to or even relocate the whole system to suit the changing needs of your business. 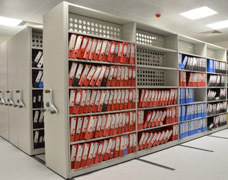 The file storage system (above left) shows a typical mobile application for storing large quantities of lever arch files within a relatively small office space. 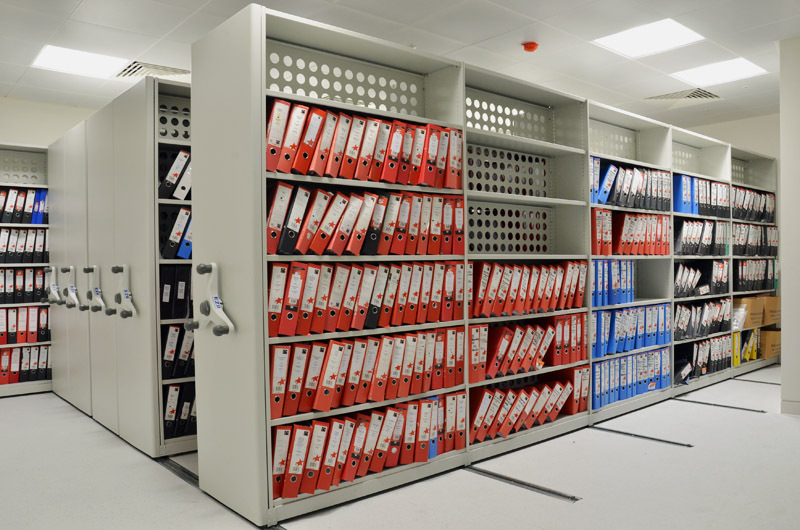 You can clearly see how the configuration of the shelving bays minimise wasted space whilst the movable units allow quick and easy retrieval of any file. 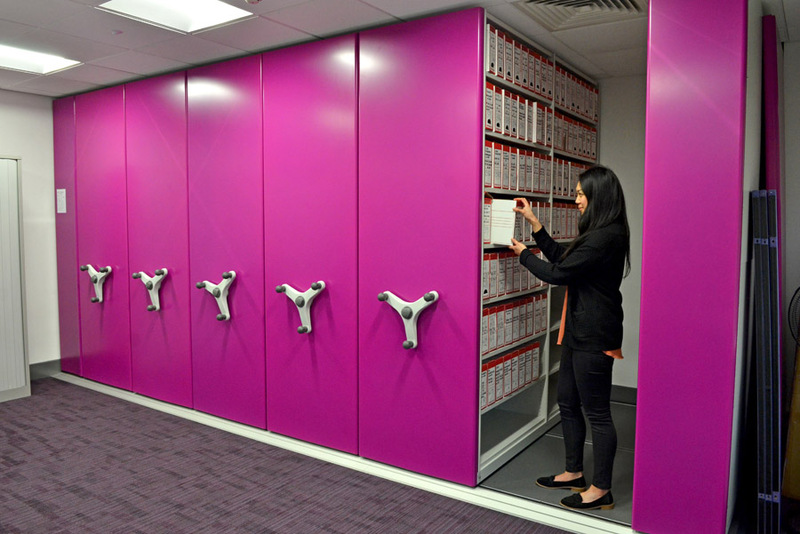 This particular mobile shelving system uses perforated back sheets to encourage natural airflow within the storage unit to help prevent the build-up of moisture. Rotating hand-wheels that drive a chain and gear system are a popular upgrade to reduce the effort required to move each section. 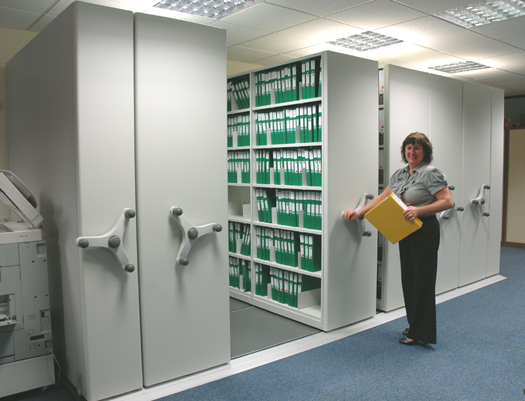 Slide-a-side mobile shelving is used in office environments to provide 'double depth' office shelving on wheels - each shelving unit moves sideways to provide access to the units at the rear. 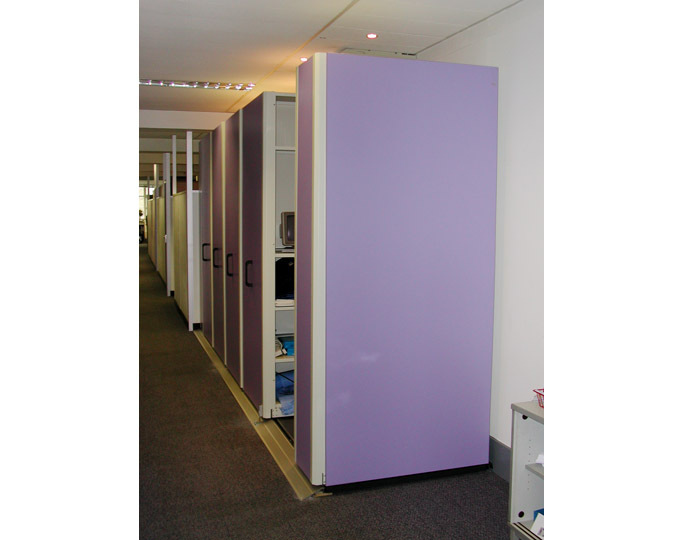 This is a cost effective solution to increase storage capacity for file storage and can be used in narrow areas where space is limited. The systems shown use one less shelving bay at the front and a typical configuration would be 3 by 2 or 4 by 3 where there are 4 fixed units at the rear and 3 mobile units at the front. 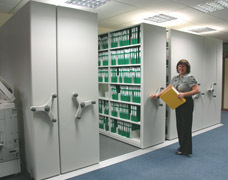 An anti-tilt mechanism is fitted to every mobile unit to prevent the file shelving from toppling. 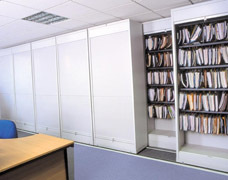 If you require a similar roller shelving solution for your office, please contact us for a free quotation. 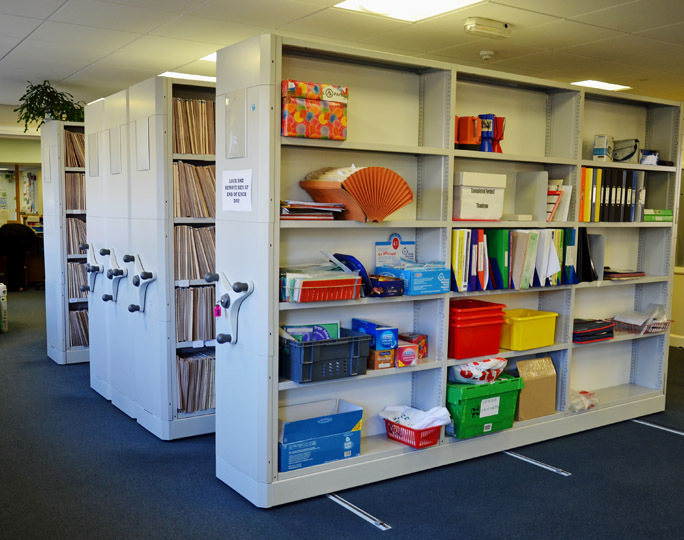 Office storage requirements can vary significantly between businesses but they all face the same problem of coping with ever increasing amounts of paperwork. 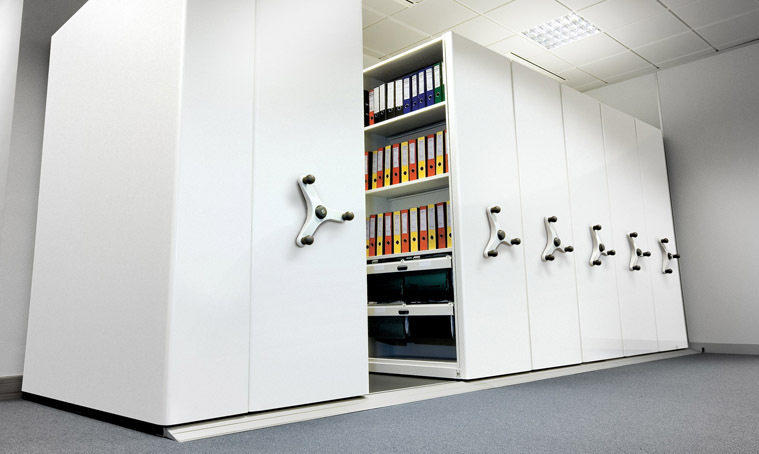 Most office areas can only dedicate a limited section to filing and storage, this often results in an untidy and dis-organised mess that is difficult to use and with no room for extra storage. 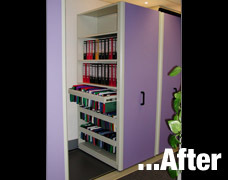 The first example shown below illustrates the major improvements made to a small office environment for general file storage. 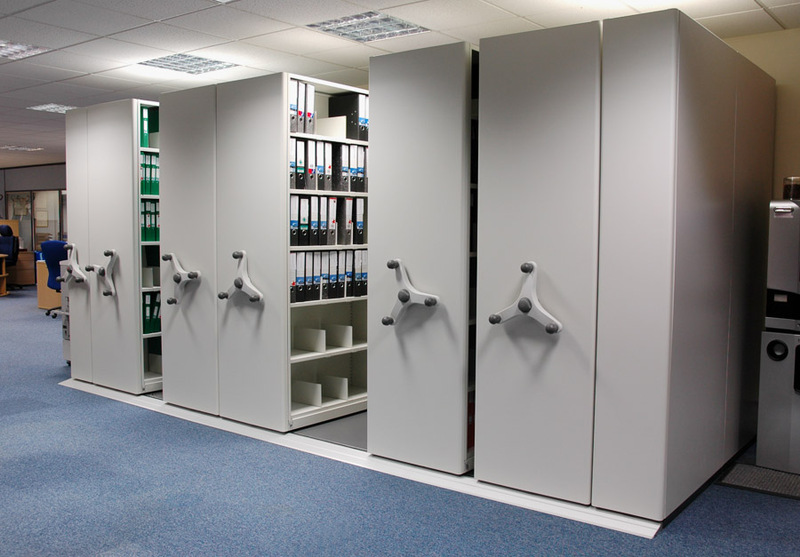 The existing filing cupboards where old, damaged and bursting at the seems with documents, our solution was to replace them with a compact push-pull mobile shelving system. 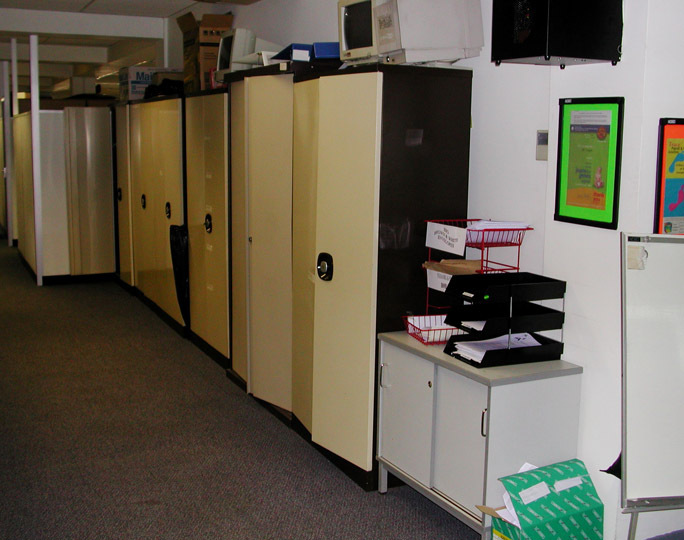 The mobile system was designed around the customer's specific storage requirements and included both standard shelving and lateral filing to accommodate every type of file that needed to be stored. 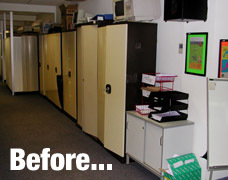 The new mobile solution reduced the amount of floor space used by 40% whilst also increasing the number of files that could be stored. 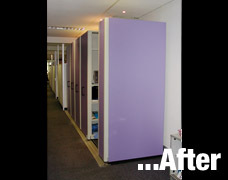 The high quality components and the bespoke colour finish (as chosen by the customer) totally revolutionised the office storage area. 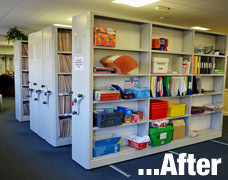 Our second example (see bottom image row) of space saving mobile shelving has dramatically increased office space within this healthcare establishment. 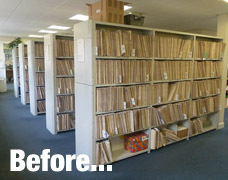 Space savings of between 50 and 60 percent have been achieved over the previous static shelves, this has allowed much more of the office area to be used to accommodate extra desks. 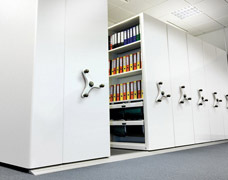 Rotating handwheels allow each of the mobile bases to glide effortlessly to allow easy access to patient files. 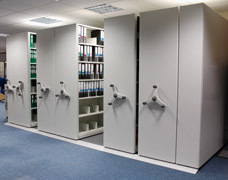 When completely closed, the final bay can be locked in place with a key to create a secure storage area - an important feature when storing sensitive information. 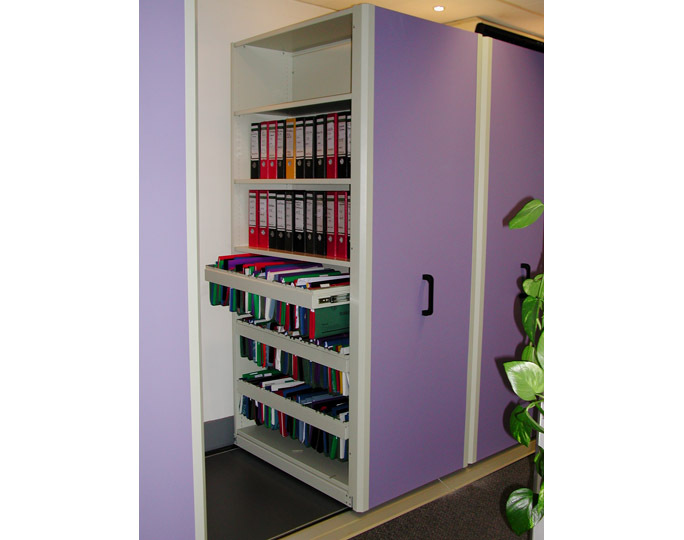 Space saving small office storage solutions like these are provided and installed to the very highest standards, helping your business to achieve the very best office storage system that perfectly suits your needs.